The Society made its first purchase in 1923 -- a horsehair couch, four side chars, a marble-top table, and a ladies' chair. 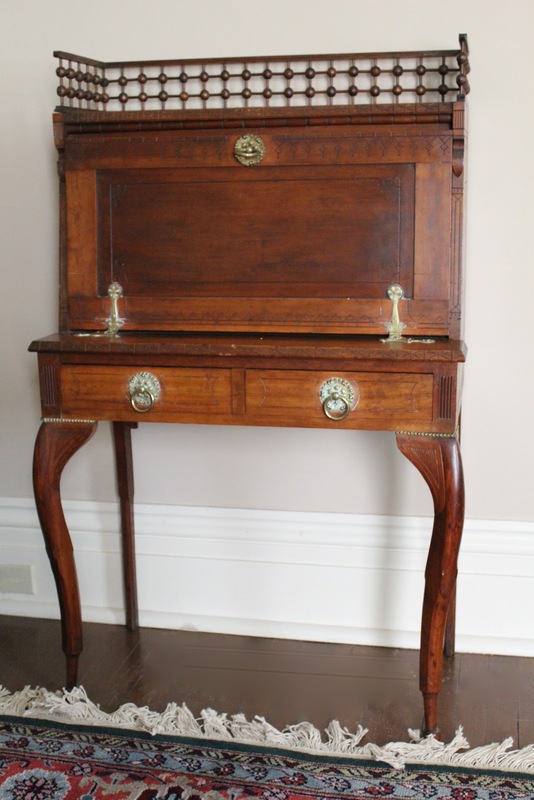 This early Victorian, rosewood furniture (circa 1840-60) was owned by the Nils Otto Tank family. Tank, the son of a wealthy politician and landowner, migrated from Norway to Green Bay in 1850 to form a settlement with a group of Norwegian Moravian immigrants. The furniture is on display at Tank Cottage at Heritage Hill State Historical Park. 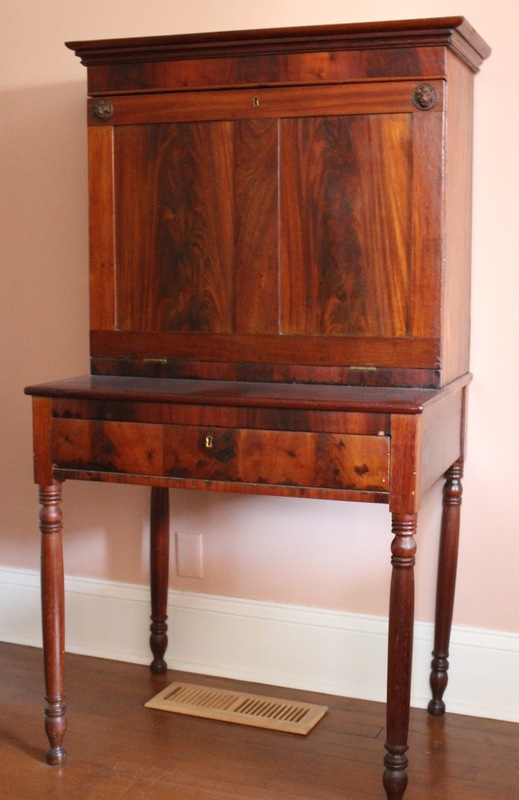 In 1924 the Society purchased this cherrywood table that belonged to Zachary Taylor (1784-1850) while serving as commander of Fort Howard (1818-1819). His possessions were all sold locally when he was transferred to the Fort in Praire du Chien. Zachary Taylor subsequently became the 12th President of the United States (1849-1850). The table is on display at the newly-renovated Guard House at Heritage Hill State Historical Park. The Society acquired this desk in 1936. Originally a sideboard of Fort Howard Commander Zachary Taylor (1784-1850), the sideboard was damaged in a fire. In 1886, Deborah Beaumont Martin, founding member of the Green Bay Historical Society, an ardent preservationist, and youngest daughter of prominent Green Bay attorney and civic leader Morgan L. Martin, had the undamaged wood converted into a desk. It is on display at Historic Hazelwood (Brown County Historical Society), Deborah's lifelong home. Part of Abraham Lincoln’s Presidential Dinner Service, the plates were created between 1861-1865 by Mark Fabrique par Haviland & Co. J. W. Boteler & Company Washington. 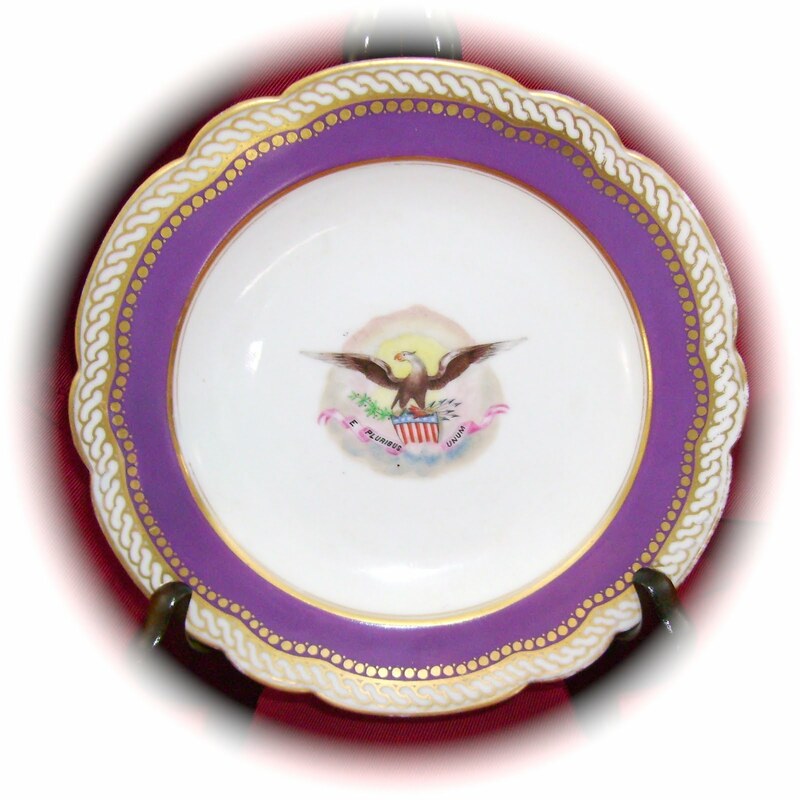 Acquired by Society founder Jesse Hurlbut Buchanan, the plates were gifted to the Society in the 1930’s. They are placed at Historic Hazelwood (Brown County Historical Society). 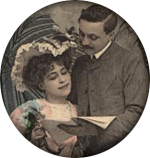 Click here for a 2016 Antiquarian Artifact Report regarding the plates. 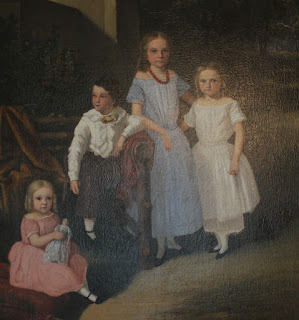 Partners Samuel M. Brookes and Thomas H. Stevenson, two English-born painters, came to Green Bay in 1856 at the request of Lyman C. Draper, then Secretary of the State Historical Society, to paint seven portraits of subjects who were instrumental in the settlement of Wisconsin. Several of these portraits are on display at Historic Hazelwood (Brown County Historical Society) and Heritage Hill State Historical Park. While Brookes and Stevenson were in Green Bay, Morgan L. Martin commissioned them to paint his children. The Morgan L. Martin children pictured, are daughters Annie (in white), Sarah (in blue), Deborah (in pink), and son Leonard. Morgan L. Martin Jr., was at school back east when this painting was done. 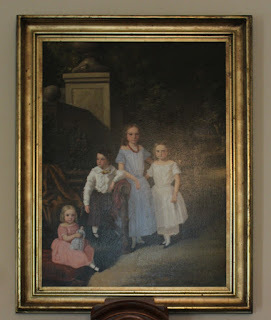 The painting is on display at Historic Hazelwood (Brown County Historical Society), the Morgan family home from 1837 to 1931. Samuel M. Brookes & Thomas H. Stevenson were the first official painters for the new state of Wisconsin. In 1857, Morgan L Martin commissioned the partners to paint a series of sketches for the Fox and Wisconsin Improvement Company, which built a series of locks and dams on the Fox River. The artists painted twelve landscapes. In 1909, Deborah Beaumont Martin, founding member of the Green Bay Historical Society, an ardent preservationist, and youngest daughter of prominent Green Bay attorney and civic leader Morgan L. Martin, sold eleven paintings to the State Historical Society. This painting of the Grand Chute lower locks remained in Green Bay where it was discovered in an attic in 1965 and gifted to the Society. The painting is on display at Historic Hazelwood (Brown County Historical Society), the Morgan family home from 1837 to 1931. 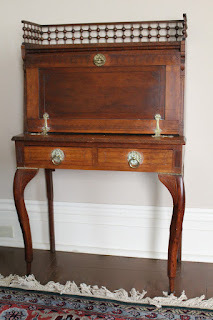 According to Boyd family legend, this desk came to the Green Bay area with Col. George Boyd (1779-1846) and his wife, Harriet Johnson Boyd (1775-1850). Harriet’s sister was Louisa (Johnson) Adams, wife of President John Quincy Adams. George Boyd served as the Indian Agent in Green Bay from 1832 to 1845. 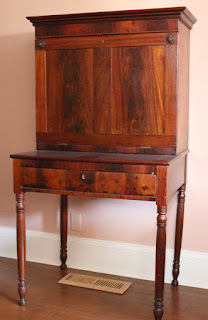 Upon Harriet's death and according to the terms of her Will, the household inventory was sold at auction, "with the exception of one secretary desk". The desk was displayed at the United States White House from 1973-1980, and was also part of “The White House—Treasury of Our Heritage” display at Macy’s Department Store in San Francisco in 1980. The Society acquired the desk in 1994. It is currently on display at at Historic Hazelwood (Brown County Historical Society).